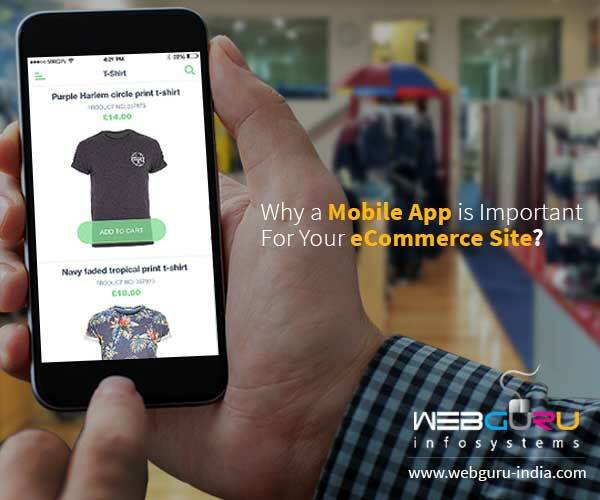 Why Your eCommerce Website Needs A Robust Mobile App? Is your eCommerce site recording a consistent high sale volume? If the answer is in the affirmative you need a mobile app and if in the negative, then too you need a mobile app. Sounds quite perplexing Right? Well not quite as mobile applications have become the flavour of our times and have the potential to drive sales. So, if you have a mobile app for your eCommerce site then your sales volume can show a further increase and if not then more the reason for you to go for an eCommerce mobile app development exercise. However, an important question concerning this is to ask why mobile applications have become so important. The reason can be explained by the easy accessibility of mobile phones (read smartphones) and the ever expanding footprint of net connectivity in most parts of our world. Let’s agree to one thing though that accessing the internet, and by corollary, your eCommerce site as well, is much more convenient on a mobile phone due to the device’s easy manoeuvrability than say on a desktop where you have to be glued to your seat. Let’s discuss some statistics regarding the increasing relevance of mobile phones for accessing eCommerce sites. As per the survey conducted by comScore, a leading cross platform measurement company that studies consumer behaviour across platforms, the number of mobile users have surpassed that of the desktop/laptop users and a third of digital traffic to retail websites gets generated through mobile phones. In other words, if you ignore this segment you are practically ignoring a huge chunk of customers who are mostly young and raring to go. Moreover, as more people have begun to use sundry eCommerce sites to meet their shopping needs instead of visiting brick and mortar stores, the growth potential of eCommerce as a business model is only going to increase in future. Hence, one need not be that business savvy to understand the immense potential of mobile app for eCommerce websites. Better Accessibility: Opening and browsing a mobile app is easier than accessing a particular site on a browser – a fact buttressed by 78% of users as per a comScore study of November 2014. The reason being on a mobile browser you need to remember the site’s URL or select one from a Search Engine Result Page – not a seamless exercise than getting to the site at one go courtsey a mobile app. Push Notifications: By virtue of having the mobile app of your site your customers can receive marketing notifications such as ‘Enjoy blockbuster discount sale to the tune of 20% this Christmas’ in an instant. This can drive better sales volume for that particular day as users would get these notifications without even opening the app. Better User Experience: Since a mobile app is faster to get loaded compared to a standard html page, it is preferable to users. Moreover, users can see the line of products in a format that is preferable to them as opposed to visiting a website where they have to browse through a labyrinth of links and pages. Besides, a mobile app needs less bandwidth than a full fledged portal – a reason good enough for users with data saving plans. The fact that a mobile app can be accessed offline has increased its appeal among users as well. Lastly, thanks to the app your customers can easily browse the range of products present in your online store without having to spend costly internet browsing hours. Establish Brand Loyalty: In all probability you keep the apps of your choicest service providers only. This is true of eCommerce sites as well. If a consumer keeps an app of your company then be rest assured of him or her being swayed by your brand. Thus, there is a greater likelihood of him or her visiting your site or recommending the same to others compared to that of your competitors. Embracing customers who use mobile phones is the need of the hour as they drive better business volumes. Besides, the future trend too is likely to be skewed in favour of mobile users. Hence, go for mobile app development to offer a personalised shopping experience to your customers. This exercise of yours would go a long way in establishing your eCommerce brand and realising ROI. Mobile App increase website presence, drive traffic and conversion. That’s really a great article. The study also proves that Mobile user day-by-day has increased at a great pace.